As in previous episodes this season, “The Book of Blood: Chapter One: Requiem” begins with another glorious musical interlude as we watch Gambi run errands. Unfortunately, as he’s driving home, Gambi is set upon by assassins. They pull up next to him and unload a hailstorm of high-powered bullets. Luckily, Gambi’s car is decked out in some hella bulletproof glass. The chase continues through the city, and all the while, the integrity of the bulletproof glass diminishes. In a (seemingly) desperate move, Gambi maneuvers his car into an abandoned lot. The car flips and lights on fire. Presumably, Gambi has died (though, if you ask me, I choose to believe Gambi maneuvered his car like that on purpose to draw attention and make his escape in the car fire. Js.) Regardless, the remainder of the episodes follows the Pierce family as they attempt to come to terms with the death of their mentor. Henderson brings Jefferson news of Gambi’s death and Jeff is in total shock and denial. Henderson shares what he knows with Jeff and Anissa, who is also at home. 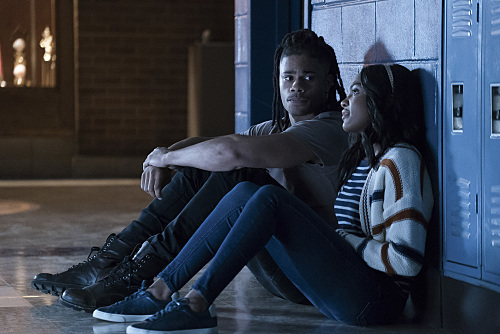 In the process, Anissa finds out that Henderson knows they’re #BlackLightning and Thunder. Interestingly, Jefferson believes that Gambi id able to escape the fire, afterall, the police haven’t found a body. So, Jeff counsels Anissa to be patient. However, Anissa seems pretty convinced that Gambis is dead and tells Jennifer the news. 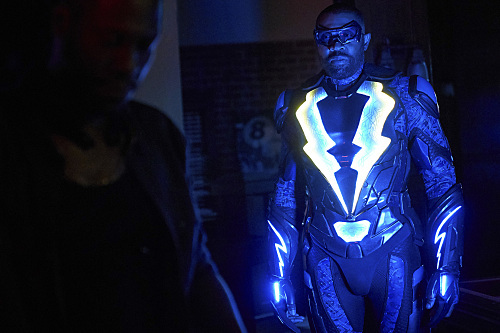 Later, as Black Lightning, Jefferson questions witnesses about Gambi’s death: “Why would the government want to kill a tailor?” The question of the hour… especially since I don’t think Gambi is dead! Still here. Still shipping Jennifer and Khalil. Jennifer AKA Black Rapunzel, is struggling with transitioning to homeschool. She feels trapped by her parents and her powers, and really wants to reclaim her former life as the Princess of Garfield High. Jennifer tells Khalil this when they meet at Garfield, and both commiserate about losing their former lives. Later in the episode, Khalil meets Jennifer at home to offer support as she mourns Gambi’s death. Khalil, TOBIAS WILL KILL YOU. How can we get him out from under Tobias’s thumb??? As far as Tobias, he has Khalil kidnap Councilman Kwame Parker, but for what purpose? After an exchange of insults–Parker calls Khalil a Bootleg Bob Marley, Tobias calls Parker Wannabe Audacity of Hope–Tobias makes his “request.” Tobias wants to donate money to help move the free clinic. But, why??? Curing the Green Light babies… or not. Lynn has been able to develop a cure for the Green Light babies, but is hesitant to use it. Of course, Dr. Jace would want to experiment with no concern for lives. SMH. Anyway, Dr. Jace has an interesting theory… maybe all the Green Light Pod babies are connected? 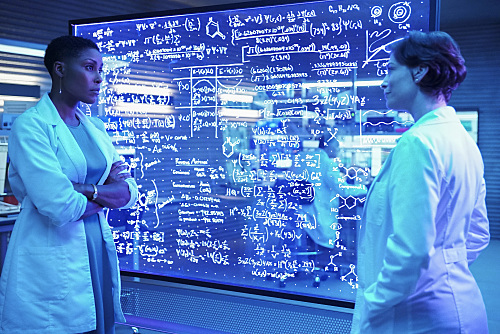 She is able to convince Lynn that there’s a way to administer the cure that would minimize risk of harm. Unfortunately, half of the Green Light babies still end up dying… Jace counts it as a win, but Lynn is furious. She punches Jace and demands security return her to prison. What’s going on in South Freeland?! AKA, I’m not at your disposal, Anissa! But Grace seems to be dealing with her own issues, too… like the fact that her skin seem to be infused with some sort of energy/superpower. Is Grace a meta, too?! Anissa begins work as a volunteer in the free clinic that she and her father helped to save from a bomb scare. One night, Anissa is checking on a pregnant woman… and her boyfriend, Deacon, is incredibly agitated. Eventually, Anissa is able to do her job, despite Deacon’s harsh words and shifty actions. Later in the episode, Deacon returns to the hospital and dies in Anissa’s arms, while beginning her to save his child. After he dies, an odd, silver gel oozes out of Deacon’s face. Anissa collects a sample, and decides she needs to head out to South Freeland to investigate. The episode ends with Anissa making that drive and being stopped by a creepy sheriff who seems to be experiencing that same condition. What’s going on in South Freeland?! Black Lightning airs Tuesdays at 9p/8c on The CW.